Yunnan is a microcosm of China in the areas of minority affairs and nationality relations. The province has 25 minority groups, nearly half of the country’s total ( 56 ethnic groups ). With such ethnic diversity it is important to ask the question: what criteria are used to determine minority status and classification? Basically, there are five ways: Race, Language, Culture, Religion, History. This is an unconventional tour including winter experience at Yuanyang Rice Terrace and Summer experience(tropical forest) at Xishuangbannan. This tour focuses on attractions of the cities of south Yunnan. This could also be a minority discovery tour, because you may find minority features like Yis, Hanis, Lahus, Was and Dais. Visit the tropical forests in the south of Yunnan and other attractions among the area. Experience the different ethnic lives and cultures. 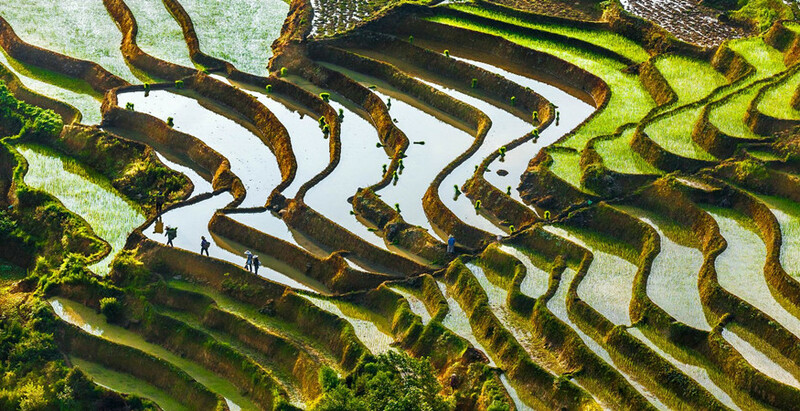 Appreciate the colorful rice terrace. You’ll begin your journey to the diverse and captivating province of Yunnan from the capital city, Kunming. Upon arrival at the Kunming International Airport, meet your local guide and transfer to the hotel. You will drive 86 km to the Stone Forest. There is a local saying: ‘It is a waste of time not to visit the Stone Forest while visiting Kunming’, which vividly expresses the deep love of the local people toward this world wonder. The quintessential karst landscape makes every tourist lost in wonder. And then, you’ll drive around 4 hours to Jiangshui. After arriving at Jianshui, visit the Jianshui Old Town and the Chaoyang Gateway, which was built in Ming Dynasty (1389). It is also known as ‘Miniature Tian’an men’ because the out shape of it is similar to Tian’anmen Square in Beijing. Visit a typical southern private garden-the Garden of Family Zhu. –Jianshui is a small town in Honghe prefecture, in the southern part of Yunnan. It is on the road from Kunimg to the famous Yuanyang rice terraces, most of the travellers stay one night here to enjoy the atmophere of an ancient Chinese town. There are numerous buildings of historic value and places of interest in this area, including over 100 temples, academies of classical learning and large residences. Those are still kept in good condition, including the Chaoyang Gateway Arch, the Jianshui Confucius Temple, the Zhilin Temple, Shuanglong Bridge, the Private Garden of the Zhu Family and the Ancient Nalou Office Building. In the morning, visit the Confucius Temple, which has a history of 700 years. It is the second largest Confucius Temple in China. Then you’ll visit Tuanshan Village, Shuanglong Bridge and the Garden of Family Zhang. Tuanshan Village is a rare surviving example of an intact-albeit neglected-traditional walled Yunnan village compound in southwestern China, and has been added to the 2005 list of internationally significant sites by the World Memorial Fund for Architecture (WMF), an international fund for the protection of world heritage sites. 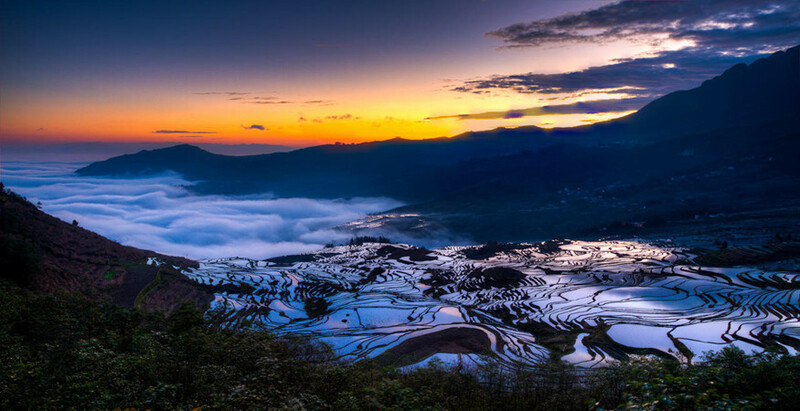 In the afternoon, you will transfer to Yuanyang and enjoy the sight of terraced fields of Laohuzui (Tiger Mouth) at sunset. Overnight at Mengnong Chieftain Palace. 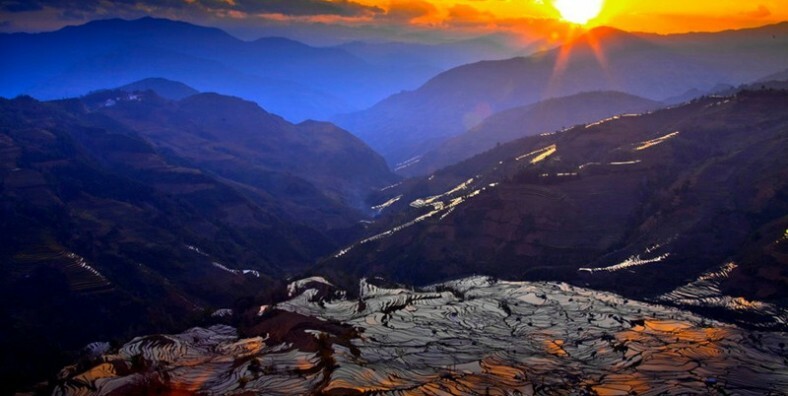 –Yuanyang is about 300km south of Kunming, renowned for its rice terraces, which was claimed as the world’s largest and most spectacular one, crafted out by bare hands by the Hani people one thousand years ago and is still in use today. The rice farmers have had to practice ecology and land preservation centuries before those concepts were widely accepted around the world. Without hard work maintaining the terrace walls and irrigation system, the precious top soil would wash down the hillsides into the rivers. 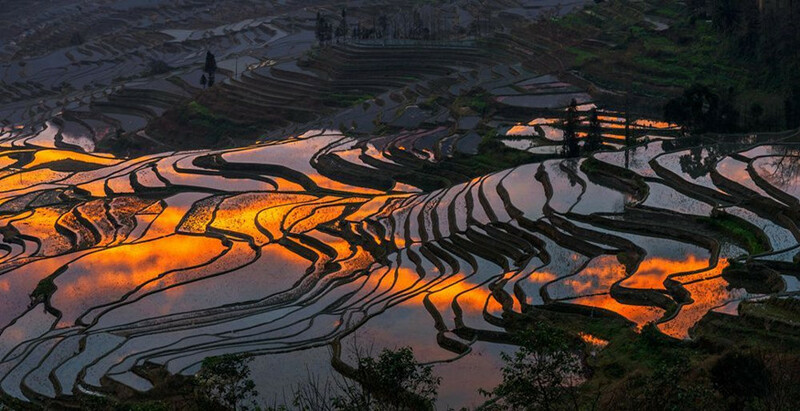 Yuanyang Rice Terrace is a self sustaining ecosystem. During winter to early spring, the entire field is irrigated with spring water from the forest above to rejuvenate and getting prepared for the next season. The Hani people have repeated this for more than a thousand years. 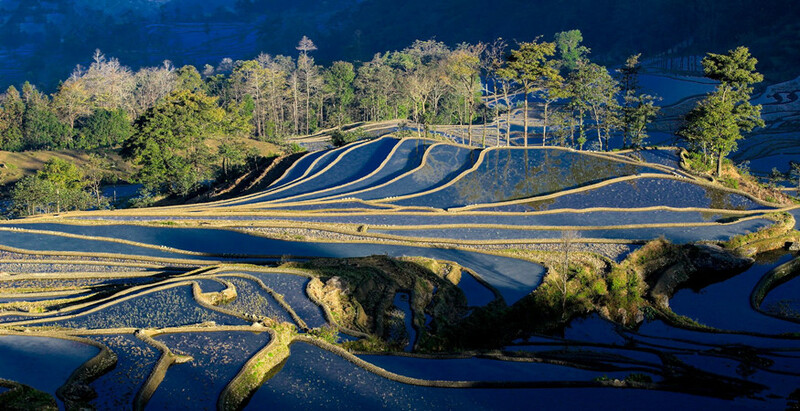 There is only one harvest in a year for the Yuanyang Rice Terrace; planting is from March to Oct./Nov. every year. 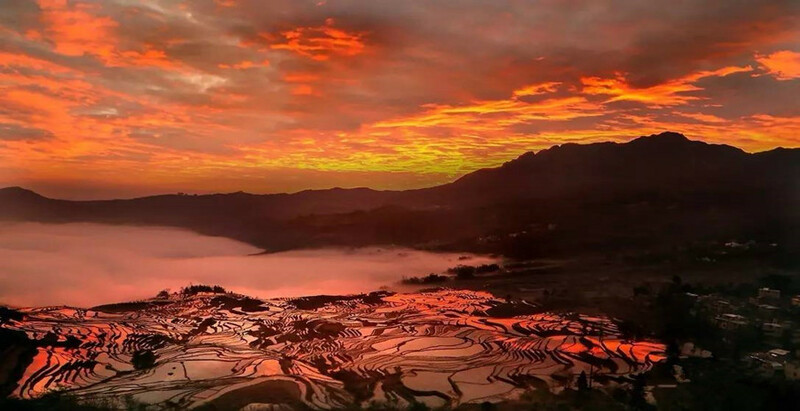 Get up very early in the morning, you’ll drive 30KM to visit Duoyishu Village and enjoy the sunrise of Duoyishu Rice Terrace Fields when the sun appears above the eastern horizon. The terraced fields are ring upon ring and cascade one by one. They go along the hillside up to the sky. You will see the scenery of the terraced fields from the top of the mountains to the bottom. There are all farms under the sunshine and cloud and mist. The landscape is spectacular. And then, you will visit Bada Hani Rice Terrace, Shengcun Market where Hani people for generations inhabit. Visit Qingkou Village and rice terraces as well. 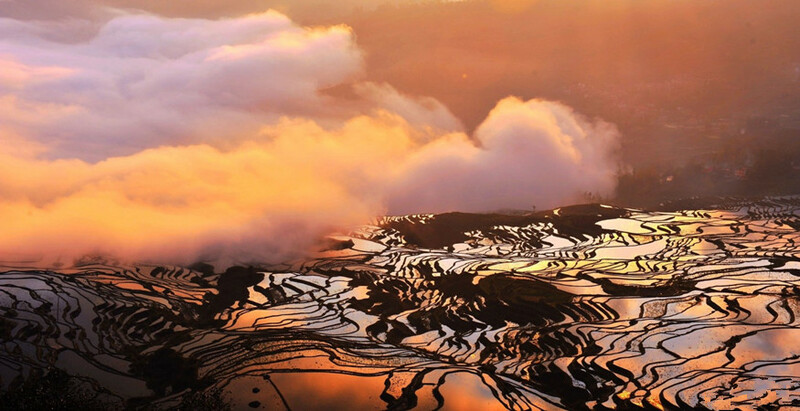 You will enjoy the sunset of Laohuzui Rice Terraces in the late afternoon at Panzhihua Town. Transfer back to Xinjie Town. Drive along the Red River Valley to Yuanjiang, visit the Great Bend of Red River on the way. Arrive in Yuanjiang, pay a visit to the Honghe Bridge, which is famous for being the highest bridge in the world. Continue the driving to Puer, visit China Puer Tea Exhibition Garden in Puer City. Located at the Yingpan Mountains, 34km (21mi) from Cuiyun District of Puer City, and near Puer National Park, the China Puer Tea Exhibition Garden covers an area of 24,167mu (1,611ha). It is an ideal place for growing Puer Tea because of the pleasant climate and great environment. There you can enjoy tea-leaves picking, processing, and exquisite drinking art, as well as buying some to bring home. Visit the Plum Lake in Puer City in the late afternoon. Meizi Lake or Plum Lake is 3.5 km long; its water area is 600 Mu (Chinese acre) and its average depth is 15 meters. For sightseeing, boating facilities have been equipped. In particular, on the lake shore, there are pavilions and archaized architectures, and corridors to display the calligraphic works of the local literati. In the morning drive from Puer to Menglun Town. Take a tour of the Menglun Tropical Botanical Garden. As the home to many rare flora and endangered fauna, Xishuangbanna is an excellent place to take in the unique beauty of sub-tropical nature and biodiversity in China. Take a visit to the Menglun Tropical Botanical Garden and observe beautiful flowers, shrubbery, and trees in the spacious garden. If you go early enough in the morning, you can see the sunrise cast a dreamy golden glow over the garden. Drive to visit Dai Ethnic Garden, located in the Ganlan Basin in Menghan County, proudly holds a national 4A rating as one of China’s top scenic spots. Within the Dai Ethnic Garden, five Dai villages – Manjiang, Manchunman, Manting, ManZha, and Manga – cover an area of 3.36 square kilometers and consist of 309 families, or 1487 individual villagers. Transfer to Jinghong in the late afternoon and pay a visit Manting Park which is a modern park that measures about 30 acres in Jinghong, Xishuangbanna. It has a large new Buddhist temple called Zongfo Si. There is a display of ethnic architecture, and people entertain themselves by water fights during the Dai Water Splashing Festival each year. Entertainment is presented in the evening. Transfer to Daluo Town and visit Daluo Border between Myanmar and China. Daluo town is located in southwest of Menghai County. The southeast is Bulangshan Mountain, the southwest and west are bordering on the Myanmar with the national boundary of 36.5 kilometers.With a total area of 400 square kilometers and superior geographical advantage, and being 81 kilometers away from Menghai County, Daluo is an important port in Yunnan province. Visit Mengjinglai Dai ethnic village. Mengjinglai is the most outstanding China-Myanmar village. It’s located in the southwest of Xishuangbanna, Menghai Town. The crystal clear Daluo River flows from the west of the village forms the natural borders for both countries. Mengjinglai is a very typical traditional Dai ethnic village. The villagers here and the Shan ethnic from Myanmar have a good relationship through inter ethnic marriage and they form a rare Dai-Shan ethnic in this area. It’s a strong Buddhist foothold with much common view of sacred trees, pagodas, holy spring, temples which make you feel a solemn Buddhist culture here. Visit One Tree Forest. Some aerial roots will grow from the trunk of the big banyan tree to whose base they would twine. Through the branches of the banyan tree breaks 32 aerial roots that are hanging down into the earth to be an aerial roots jungle. These straight aerial roots stand in lines like the soldiers who protect their motherland at the frontier, which makes people respectful. Therefore, the One-Tree-Forest scenery in Da Luo town is indispensable for the tourists to Xishuangbanna. Drive to Menghai County, pay a visit to Jingzhen Octagonal Pavilion. Jingzhen Octagonal Pavilion was built in 1701 during the Qing Dynasty (1644-1911) — the year 1063 according to the Dai calendar. It was originally built in a local Hinayana temple, but the temple was destroyed. The pavilion has retained its former features following three large-scale repairs. Free at leisure before be transferred to Jinghong airport for your departure flight. Service ends.